For two class case, I use to do the following but it is no longer valid for three classes. Ferri C, Hernández-orallo J, Salido MA. Volume Under the ROC Surface for Multi-class Problems. Exact Computation and Evaluation of Approximations. PROC OF 14TH EUROPEAN CONFERENCE ON MACHINE LEARNING. 2003;108‑120. He X, Frey EC. The Meaning and Use of the Volume Under a Three-Class ROC Surface (VUS). IEEE Transactions on Medical Imaging. 2008;27(5):577‑588. ROC Analysis was designed for dealing with only two variables: noise and no noise, so using it for 3 or more variables makes little sense. E.g. consider the IRIS data set: there are 3 classes: setosa, versicolor, and virginica. So we can build 3 classifiers (e.g. Naive Bayes): for setosa, for vesicolor and for virginica. And then draw a ROC curve for each and tune the threshold for each model separately. AUC in such a case could be just the average across AUCs for individual models. Not the answer you're looking for? Browse other questions tagged r classification roc or ask your own question. 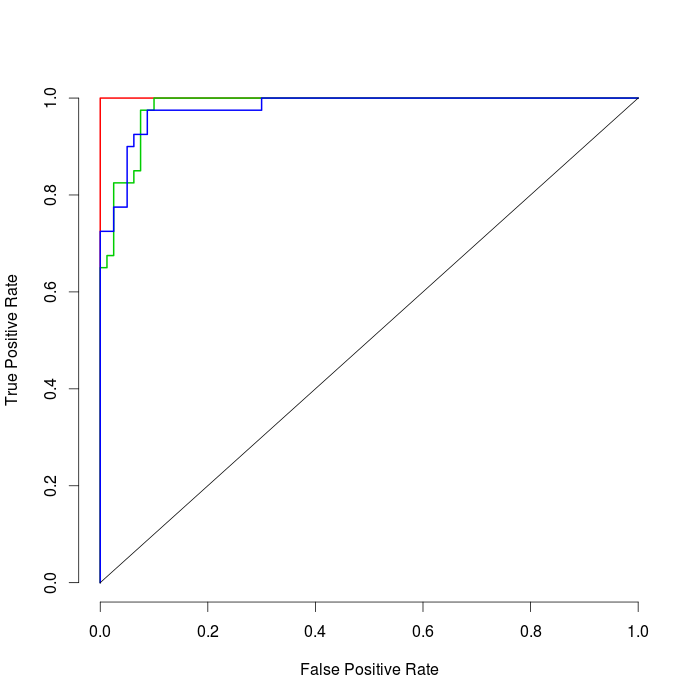 How to plot ROC curves in multiclass classification? How to draw an ROC curve?